Abraham Lincoln one of the greatest, if not the greatest, of all the American Presidents said “I like to see a man proud of the place in which he lives. 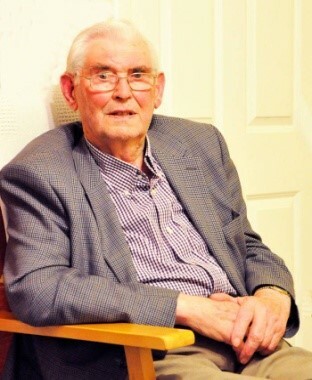 I like to see a man live that his place will be proud of him.” Tom Cleary was immensely proud of Cloughjordan parish and the Kilruane MacDonaghs club and after a lengthy life of service at both local and national level parishioners are extremely proud of him. Tom’s influence on Kilruane MacDonaghs was so great that he seemed to be always at home yet on the wider stage his impact on the farming scene was so profound that he seemed to be always away. Tom was born in Ballycapple on 25th May 1926, just three years after the ending of a bitter Civil War that had torn the country apart. He was the eldest child of Con and Margaret Cleary. In 1918 his father had bought the farm in Ballycapple on which stood an ancient O’Kennedy Castle. Tom attended the national school in Cloughjordan in a building that was known as the “Little Chapel,” now the site of the Community Creche. Tom served Mass in Grawn Church and in 1936 he was one of the servers at the last Mass that was celebrated there. In 1938 he was one of twenty boys confirmed here in St. Michael and John’s Church by Bishop Michael Fogarty. Tom was the last surviving member of that class. Tom left school at fourteen years of age at a time when there were limited educational opportunities. However, he had the foresight to attend a two-year Rural Science night course in Borrisokane Vocational School. Eager to further his education he completed a year-long Social Science night course that was run by UCC in Nenagh Vocational School. These courses were invaluable in equipping Tom with the skills he would later utilise to great effect on the family farm and in his future role as an administrator in various farming organisations. In 1948 he was one of the founding members of the Young Farmers Club in Cloughjordan. This later changed its name to Macra na Feirme. He served as secretary for six years. Tom later assumed the role of Chairman and represented the local branch on the County executive. He must have impressed the delegates at those meetings because he was elected County chairman in 1956 and held that position until 1967. Beatrice Hurley from Boulaglass, Portroe was County secretary during that period and obviously their working relational ship blossomed into something more serious and they were married in Youghalarra Church on 25th October 1961. In 1955 Tom had attended a meeting in Dublin at which the National Farmers Association (NFA), later to become the IFA was formed. A branch was set up in Cloughjordan and Tom was the local representative on the County executive. In 1960 Tom was elected to the National Council of the NFA and the National Dairy Committee and held that position until 1970. The same year he became treasurer of the IFA. Tom looked after the finances for four years and in 1974 he was elected a member of Bord Bainne, now known as the Irish Dairy Board. He became chairman in 1982 and held that position until his retirement in 2000. Tom is the only member to have served continuously for a period of twenty-eight years. He was also a long-time member of the Nenagh Show Committee, serving as chairman in 1971 and 1972. Indeed, Tom’s stock were regular prize winners in that show. In a lifetime of involvement in farming Tom witnessed many changes. He saw butter being made in the home and the establishment of the crossroad creameries. In the 1950s he campaigned unsuccessfully to have a creamery built in Cloughjordan. Tom was the first supplier to deliver milk to Nenagh creamery by bulk tank and he was later to serve on the Board of Nenagh creamery. Tom saw the government fixing the price of milk; the co-op mergers and amalgamations; the capping and the expansion of the milk quotas. In his work with Board Bainne he travelled to countries in every continent including Russia, South Africa, New Zealand and the USA. Tom met Bill Clinton, President Mitterand of France, Queen Elizabeth and the infamous Robert Mugabe of Zimbabwe. On his frequent trips to Brussels he met the heads of farming organisations from other countries and interacted with technocrats and bureaucrats in the headquarters of the Europen Union. He had travelled a long way from the quiet family farm in Ballycapple to the bustling metropolis of Brussels. Tom’s contribution to Irish farming did not go unrecognised. In 2003 he received the Horace Plunkett Award from the Irish Co-operative Organisation Society for his contribution to the Irish Co-operative movement; the Paddy Fitzgerald Award recognised his outstanding voluntary contribution to the welfare of Munster farmers and their communities while the IFA made him an Honorary lifetime member. Apart from his family and farming Tom’s great passion in life was the GAA. Growing up in the 1930s hurling was one of the few and in many cases the only pastime for young boys. He inherited his love of hurling from his father Con who won a North junior hurling medal with the De Wets in 1913. Tom would have known members of the legendary De Wets senior hurling team that brought honour and glory to the parish by winning the County and seven North titles in the early 1900s. On Sunday, 11th August 1940 as Europe was being ravaged by the Second World War and Ireland was suffering the hardships of the Emergency he went to Borrisokane to witness MacDonaghs win the North title by overcoming Kiladangan in the final and end a thirty-two year famine. How poignant it was that last year on Sunday, 16th September Tom was present in Nenagh when MacDonaghs ended a twenty-eight year wait by getting the better of Kiladangan once more in the North final. Afterwards, few in the dressing room will forget his emotional words as he addressed the players while clutching the Frank McGrath Cup. Tom’s pride and passion for the club were obvious for all to see. Tom had seen every Kilruane MacDonaghs senior success since 1940. During all those years he remained a loyal and faithful supporter. In the company of his great friend and neighbour Paddy McCarthy, Tom savoured the good days and patiently endured the bad ones. He was a staunch Tipperary follower, attending his first All-Ireland final in 1945 when John Maher captained the Premier county to victory over Kilkenny. Since that final I doubt if he missed many All-Irelands that involved Tipperary. In 1949, a year in which there were no less three junior teams in the parish, Tom played corner-back on the Cloughjordan team that lost the North final to Knockmeal Rangers. The following year, he captained the Kilruane MacDonaghs junior team, backboned by the hardy men of Kyle, to win the North Tipperary championship by overcoming Burgess in the final. The same year Tom led the juniors to victory over Shannon Harbour of Offaly in the Lord Abbot Cup final that was played in St. Brendan’s Park, Birr. At that time junior hurling was not for the squeamish and the Lord Abbot Cup was noted for its ferocity. Tom continued to play intermediate hurling with Kilruane MacDonaghs until 1953. His farming commitments were now becoming more demanding so his playing career came to an end. Tom still continued to follow the fortunes of Kilruane MacDonaghs and Tipperary. In the mid 1970s he began to ease himself back into active participation with the club when he took up a role on the committee. In 1984 he became vice-chairman and was appointed chairman in 1989. During his five-year term in the chair he saw Kilruane MacDonaghs win the North senior hurling title in 1990, something that gave him immense satisfaction. Tom was elected Vice-President in 1997 and succeeded Canon Whyte as President in 2001. He has held that honorary position since then and in doing so he became the longest-serving President in the history of the Kilruane MacDonaghs club. Tom was a very influential figure on the club committee for over forty years. As chairman he was calm and composed and never became ruffled even in the most volatile of situations. Tom was too big to take offence and too noble to give it. While many in positions of authority demand respect Tom had the ability to command it. His style was conciliatory rather than confrontational, democratic rather than dictatorial. Tom highlighted the positive and avoided the negative. He knew the value of encouragement particularly when a team was defeated so he was reluctant to castigate and eager to appreciate. After he stepped down as chairman he continued to be an active and effective member of the club committee. Tom was attending meetings up to last year until his health began to fail. Tom didn’t speak for the sake of saying something but only spoke when he had something to say. His opinions were valued by all and his advice was sought by many. In his long involvement with the club he has seen the ups and downs. Tom was in Croke Park on 16th March 1986 when Kilruane MacDonaghs were crowned All-Ireland Club Champions and he was in the Ragg in 2000 when we were relegated. In 2003 he was present in Nenagh when we won the intermediate championship and regained our senior status. Tom was no fickle supporter of either club or county. He attended matches in weather both fair and foul, at venues near and far. In 2010 the Tipperary County Board recognised his service to the GAA when he received a Sean-Ghael Award. Tom was accustomed to being honoured for his contribution to different farming organisations and remained unaffected by the fame that came his way. The Chinese philosopher Confucius said that “Humility is the solid foundation for all virtues” and Tom was the personification of humility. He wore all honours lightly and he was the same genial Tom whenever or wherever you met him. In his twilight years he displayed a determination and a resilience that exemplified and typified his positive attitude to life. When driving to matches became too demanding Carmel Daly, Jim, John and Cronan Casey were on hand to ferry him to various venues to see the black and white or the blue and gold in action. Even when his mobility became restricted he insisted on leading club Guards of Honour as we bade farewell to colleagues. It was fitting that three generations of Kilruane MacDonaghs members formed a Guard of honour and walked in silent tribute as Tom made his final journey to Cloughjordan Church. In the last few months as Tom weakened his mind remained as alert as ever. Age hadn’t dulled his memory or diminished his powers of recollection. The constant stream of visitors to Fairview Community Unit kept him well-informed of activities in Cloughjordan and in particular brought him up to date on the affairs in the Kilruane MacDonaghs Club. He had already paid his €200 for membership, the Lotto and the Tipperary Draw. Tom continued to read the local papers and was glued to the television for the Tipperary League matches. Tom did not regret growing old because he was very much aware that it is a privilege that is denied to many. Instead, he made the most of every single day and never complained as his strength gradually ebbed away. Tom has been a pillar of the community for so long that it is difficult to envisage life in the parish without him. That measured distinctive stride, slowed down by advancing years, will not be seen again. We will not experience the genuine warmth and sincerity of his greeting. The meetings and the matches won’t be quite the same without his presence. Tom’s vast reservoir of local knowledge on the games, the players, the personalities and life in bygone days will no longer be at our disposal. No Google search will unearth the mine of information that he possessed. He always had time for a chat. Indeed, it is difficult to believe that he accomplished so much yet never seemed to be in a hurry. Even in his declining years he had that aura of nobility. In Shakespeare’s play Julius Caesar, Marc Antony referred to Brutus as the “noblest Roman of them all. “ Without fear of contradiction I think it can be stated that Tom Cleary was one of Cloughjordan’s noblest personalities and one our greatest ambassadors. On behalf of the Kilruane MacDonaghs club, a club Tom loved so dearly and served so faithfully I extend sympathy to his son Dermot, daughter Deirdre, son-in-law Roger, grandchildren Roisín, Kevin and Jack, sisters Maura, Kitty, Sr Bridget, Sr Peggy and extended family. Some wise person said that everybody dies but not everybody really lives. Nobody could dispute that Tom Cleary has lived his life to the full. Today, we mourn the passing of an iconic figure in our parish. One of the most tangible links we had with our past has been broken. President Theodore Roosevelt said that “Courtesy is as much a mark of a gentleman as courage.” In a life that has spanned almost 93 years Tom was unfailingly courteous to all who came across his path and his courage was never more apparent than in manner in which he coped with his recent illness. We have all been privileged to know Tom Cleary of Ballycapple, a gentleman to his fingertips. On Saturday the Kilruane MacDonaghs senior team begin their campaign with a match against Kiladangan in Puckane. For the first time in over eighty years the familiar figure of Tom Cleary will not be present. A minute’s silence will be observed before the game. Hopefully, the lads will honour his memory with a top class top-class performance. Let all of us in the Kilruane MacDonaghs club players, management, officials and supporters leave no stone unturned in our efforts to retain the Frank McGrath Cup and maybe go one step further in 2019. Nothing would please Tom Cleary more. It would be a fitting tribute to his memory. Gan dabht ar bith ní bheidh a leithéad arís ann sa pharóiste seo. Go soilsí solas na bhFlaitheas ar a anam uasal.